I really enjoy macro photography but rarely practice it “in the field.” Often when I’m out doing a shoot I don’t even bring the macro lens along. Really it just comes down to what I’m able to comfortably carry. The 100 macro is just “one lens to many” to fit into my routine. The result is that most of my macro shooting is done at home, in a studio type setting. This image was no different. I went out into the yard looking for subjects. I found this flower as well as a few other items and set up my “studio.” The studio consists of a Wimberley Plamp, a small compact fluorescent light (CFL) and a back drop; in this case a dish towel. I find that with macro work you need to work the scene just as you would when shooting a landscape. I rarely find a pleasing composition on my first exposure. It takes moving the camera, the object and the focal plane to extract that one shot that grabs your eye. As I usually do, I started with just the Canon 100 f/2.8 macro lens. After working with it for a while I decided that I needed to be “closer.” I added 68mm of extension to the rear of the lens. The actual exposure was 1.6 seconds at f/18 and ISO 100. When shooting landscapes I generally avoid f/stops about f/13 to limit diffraction but I find that in macro work it’s much harder to see the impact. 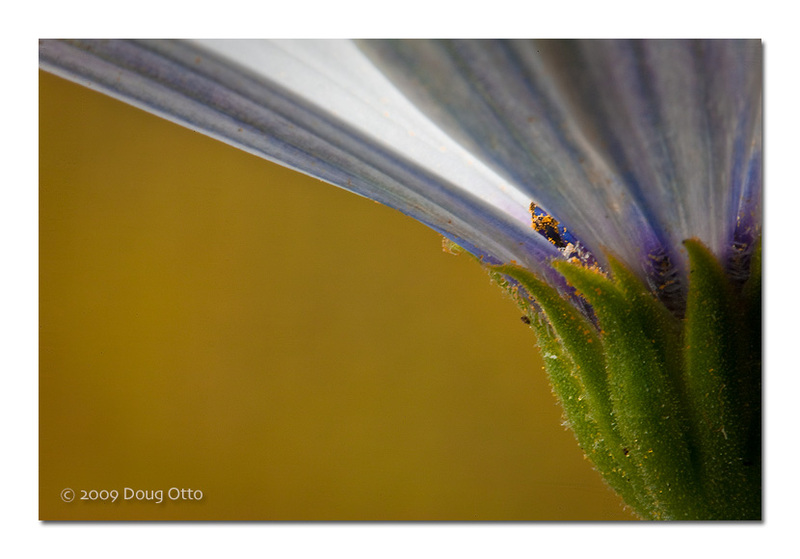 This entry was posted in Photography and tagged canon 100 f/2.8, Canon 5D, doug otto, flower, macro, Photography, pollen. Bookmark the permalink. ← Is that Photoshopped or is it real?